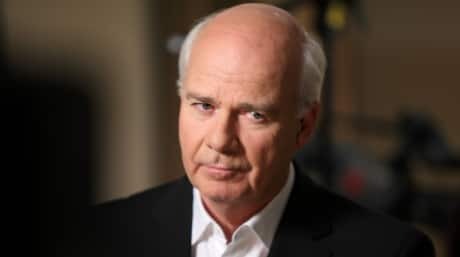 Our Chief Correspondent Peter Mansbridge wasn't on the set as host of The National last night. Instead he was a few blocks away, receiving a significant honour. Peter, along with Postmedia CEO Paul Godfrey, were inducted into the Canadian News Hall of Fame. They joined a list including legends of our business such as William Lyon Mackenzie, Knowlton Nash, Trina McQueen, and Lloyd Robertson. We're extremely proud of Peter. At last night's event, he gave an induction speech showcasing many of the attributes that his colleagues appreciate every day. He paid tribute to the great journalists he has worked with. And he had fun with a series of jokes about his own reputation and that of the public broadcaster. Now, I've been at the CBC almost fifty years so I'd like to take this opportunity to say a few words tonight about the future of the place. First of all, let me be clear: I'm not one of those who say "if only the CBC could relive its golden years." Sure, we did a lot of great programming in the past. I know; I was there. But let me assure you, they weren't all golden. We had our share of "brutal" too. And besides, constantly living in the past isn't fair to the present or the future. And it's not useful either. I'm also tired of hearing people, many of them at the corporation I might add, talk constantly about life at the CBC today as a "struggle" and a "challenge". To me, it's actually an "opportunity" to set ourselves apart from the rest. Sure, we can look around and see more media saturation than ever. There are more options, more choices. But really there's a lot of sameness there, which is all the more reason for us to set ourselves apart. Now, it's old news to say the media is changing. It's even older to wax on about social media and the different ways people consume news. Things always change. They always evolve. But two things don't change: facts and great storytelling. And we keep using the latter to report on the former. And we do that as well as anyone in the world. And we're continually recognized for that. For example, Adrienne Arsenault in Brussels doing a special fifth estate just weeks after winning an International Emmy for Ebola coverage in Africa. Susan Ormiston in Beirut doing the refugee story just months after being recognized for outstanding journalism at the Monte Carlo TV Festival. And Nahlah Ayed in London after a grueling few months in Paris covering the attacks, and all over Europe covering the migrant/refugee story. Three correspondents at the leading edge of our internationally respected journalism. But they're not alone.They're helped and pushed by a new generation of young people.They're excited, they're fresh, they're funny. They're not afraid to take risks, and they're so smart - really smart. And today more than ever, they are a reflection of the Canada we see in our communities. But we need to be better. A public broadcaster must reflect the public in every way. And it must reflect the public interest. Public broadcasting is as important now as it's ever been. - It's clear of outside influences. This is critical and must be protected. - Its mandate is to reflect the country and those living in it - all those who live in it. - Our country is changing: how it looks; how it feels; what it believes. - Our job is to find those common threads and expose them. - It's not about being popular; it's about being relevant. There is a big difference there. It's not about clicks or retweets or Facebook likes. It's easy to get caught up in that. It's about making sure what we do matters - and not in an earnest way. But that what we do has an impact. As a public broadcaster we are in a unique position to be able to do that. It's time to throw out some convention. Double down on new techniques, even when others don't seem to understand that time has passed the old techniques by. It's so easy to get caught up in the "challenges" of the past few decades. I'm not saying we shouldn't speak out against what we think is damaging; of course we should, whether that's in the actions and words of our critics, our management, or ourselves. But I see what we have managed to accomplish in spite of what we and others have lived through: funding cuts, staffing cuts, competition from every angle, criticism, cheap shots and nastiness. I look at the young people who work alongside me, all of whom have never known anything different, yet who do such great work. Who believe in public broadcasting; who understand that public service and public broadcasting are not all that different; who aren't afraid to take risks; who aren't afraid to question and reject how things have been done in the past; who are excited about the future; who want to be engaged in making the CBC a better place. I have faith that Canadians will continue to believe, as the surveys show they do today, in a national public broadcaster. They believe that the future for the CBC can be even better than its illustrious past and its award winning present. I know that while we enjoy this evening of celebrating the past, there are young reporters, producers and editors right across the country who are tonight making calls, making pitches, working sources, producing great stories - always striving to bring the information that matters to Canadians...to Canadians. Because they care. They care at least as much as I did when I was their age. To constantly say the CBC is suffering; to say the CBC is under attack. To say the CBC isn't what it once was...is to undermine all of those young people that will lead us into the future - one that will be both tougher and brighter than I could have imagined. I believe they are up to the challenge. Take that young man sitting over there at the table. It's my luck and Cynthia's luck that he is our son. It's in him that I see the future of this incredible country, of the CBC and of news. At sixteen he's thinking about his future. So far it's not one in journalism, but he is a news consumer, just like most of his generation - consuming news and information at rates far beyond what we ever did and with tools we couldn't dream of. So I look at will, and I look at the young people I work with, and I know that the future will not just be "good". But that it will be great. The time will come when I will move on. And when I do, I will miss what we do very much. What we do is important. It's honourable and it is constantly exciting. I deeply appreciate this award and your recognition.